If there is one element of Thoroughbred racing that has always held true it is that the tides of fortune change very quickly. It is the one sport where you can idolize a Babe Ruth as a fan one day and strike him out with the bases loaded the next. Only here can two worlds intermingle, no matter how divergent they may be. Only here can a 32-year-old female trainer who did not win a single race in her first two years of training win a grade I stakes at Saratoga in only her third year, defeating the likes of Todd Pletcher, Wayne Lukas, Kiaran McLaughlin, Steve Asmussen, and Chad Brown. In the world of training, some horsemen take years of struggling before elevating themselves into elite company, most never make it at all, while others latch onto that special horse at a young age and are allowed to show off their talents on the sport’s biggest stages. Maria Borell’s world and her ambitions have been fueled by her love of horses since the age of 6. 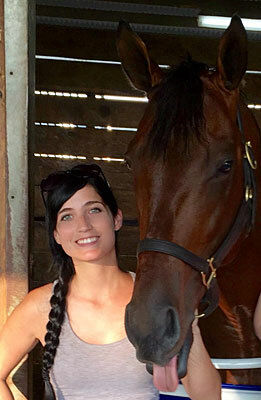 Unlike many other young trainers, she was able to cram her struggles and disappointments into a brief window of time and virtually overnight has found herself going from training three of her own horses and never having won a race to training the top 3-year-old sprinter in the country and one of the favorites for the upcoming Breeders’ Cup Sprint. The instant love affair between Borell and James McIingvale’s Runhappy is becoming well-known in the Thoroughbred industry, thanks in part to the colt’s remarkable speed and class and Borell’s infectious and warm personality. One of the most precious photos online is of Runhappy sprawled out in his stall asleep, with Borell curled up next to him with her head resting on his neck. Another shot of them lying together head to head shows RunHappy’s head cradled in her arm, with her head resting against his. So, just how did this extraordinary story evolve? How did this son of Super Saver come off allowance victories at Indiana Grand and Ellis Park to run away with the grade I King’s Bishop Stakes at Saratoga in a blazing 1:20 2/5 for seven furlongs at odds of 11-1 and then follow that up by beating top-class older horses in the grade III Phoenix Stakes at Keeneland, despite breaking poorly from the rail and rushing up in :21 2/5 for the opening quarter, which would have killed off most horses? Behind him in that race was last year’s Breeders’ Cup Sprint winner Work All Week. And how did a 32-year-old unknown trainer with only three horses come to train this remarkable horse? The story began in 1989 when 6-year-old Maria Borell was watching Sunday Silence beat Easy Goer in the Kentucky Derby on TV with her father at their home in Syracuse, N.Y. Shortly after becoming enamored with horses, Borell began watching the TV show “Inside Racing” with Harvey Pack, and took a liking to a filly named Miss Josh, who won 14 of 29 career starts for trainer Barclay Tagg, including the grade I Gamely Handicap and six other stakes. When she decided to go to the track and begin galloping, the trainer she wanted to work for was Tagg, so she kept writing him letters. He finally wrote back and told her if she could get to Saratoga by a certain date he’d help her out and give her a shot. When it was time to move on, Borell became an assistant trainer and worked for a little while as a veterinary technician. But things didn’t work out as she had hoped. The trainer she worked for was “kicked out” of New York, after which she received an offer to train privately for a New York-based owner. That job didn’t work out any better. “By the time I got the horses ready to go was when the economy crashed and he sold everything,” Borell said. “I was pretty frustrated. I just got up and moved to Kentucky, and didn’t really have a plan. It would take me another four or five years to get horses to train. Borell was training only three of her own horses, and in two years of training was winless in 22 starts, with only three seconds and a third. The first year, in 2013, six of her nine starts were in claiming races, with her horses earning just over $7,000. The following year she was 0-for-13, but ran in only two claiming races, and most of her starts were at a mile or longer. That year, she upped her earnings slightly to $10,575. In the early spring of this year, Borell was contacted by Laura Wohlers, racing manager and trainer for Jim McIngvale, owner of the Gallery Furniture retail chain in Houston, Texas. McIngvale, known as Mattress Mac from his numerous ads and TV commercials, has owned horses for decades, using such illustrious trainers as Nick Zito, Bob Baffert, and Jack Van Berg. Baffert nearly got him to the Kentucky Derby with a leading contender in 2004 when Wimbledon captured the Louisiana Derby in impressive fashion, but the colt was injured in a workout a week before the race, which sidelined him for over a year. “Laura told me someone had recommended me as trainer and she flew up and met with me and we got a long along pretty well,” Borell said. All their horses were in Louisiana at the time, except one 3-year-old colt named Runhappy, who was at a layup farm in Kentucky, recovering from an injury suffered in the LeComte Stakes at Fair Grounds, in only his second career start. McIngvale had paid $200,000 for the colt at the Keeneland September yearling sale. So, just like that, Borell had herself a high-profile job training good horses, but she had no idea just what was waiting for her. Runhappy had made his first two career starts with Wohlers listed as trainer, winning his debut at Turfway Park by 8 1/4 lengths before going right into the LeComte. “When they decided to bring the horses up from Louisiana I guess they just decided they needed a set of eyes and hands that were physically here,” Borell said. “Laura had asked around and someone recommended me. I didn’t have a great training record, only a couple of seconds, but my horses always looked the part. And the person who recommended me knew I was hard worker. Laura knew him because they had horses who had raced against each other. It didn’t take Borell long to realize she had something special on her hands; certainly something way beyond anything she had trained before. “The first time I breezed him (at the Kentucky Training Center in Lexington) I had the biggest grin across my face,” she said. “I was telling everyone this horse will be in the Breeders’ Cup and they thought I was crazy. He’s such a special horse. The thing about him is his turn of foot; he really extends his stride. We measured his stride during a breeze and it was 25 feet, and that’s not even in a race. I knew he was special and kept telling everyone I had THE horse in the barn. Borell found a good spot for him in an allowance/optional claimer at Indiana Grand on July 7, which came up muddy. The word obviously was out on him and he went off as the 9-5 favorite under apprentice rider Erin Walker. Neither raced proved much of a test for Runhappy, who won by five lengths at Indiana, and by 2 3/4 lengths at Ellis after blazing a half in :44 flat and finishing up his 6 1/2 furlongs in a sharp 1:15 flat, equaling the track record. So confident was Borell in Runhappy, she decided to jump him way up in class and tackle the best 3-year-old sprinters in the country in the grade I King’s Bishop Stakes on Travers day. Joining him was another Kentucky-based colt named Limousine Liberal who had made his last start at Ellis Park, winning a six-furlong allowance race in a sizzling 1:07 4/5. Sent off at 11-1, Runhappy, with Edgar Prado replacing Walker, ran his 10 opponents off their feet with a :44 2/5 half and kept pouring it on, winning by four lengths in a near-record 1:20 2/5, with Limousine Liberal completing the Ellis Park exacta. Facing top-class older sprinters in the Phoenix Stakes, Runhappy broke slowly from the rail and had his saddle slip, both recipes for disaster. To add to that, he rushed up and scorched his opening quarter in a suicidal :21 2/5 and then a half in :44 4/5, but amazingly kept on going, winning by 1 3/4 lengths, this time as the 7-5 favorite. Behind him were last year’s Breeders’ Cup Sprint winner Work All Week, this year’s grade II Amsterdam winner Holy Boss, last year’s Breeders’ Cup Sprint third-place finisher Gentlemen’s Bet, and last year’s King’s Bishop runner-up Fast Anna. Borell’s dad has attended all of Runhappy’s races, and her mom is excited to see her daughter’s success. Borell was thrilled to have her aunt and uncle in attendance at the Phoenix, coming down from New York. Now, she just has to find a way to get Breeders’ Cup seats for everyone, including her three sisters if they all are able to come. Of course, her seat will be available, because she plans on spending the entire day at the barn with Runhappy, who will not van over to Keeneland until the Wednesday before the race. The Breeders’ Cup Sprint was shaping up as a showdown between Runhappy, the brilliant and classy Private Zone, and the fast and tenacious Rock Fall, coming off a hard-fought victory in the Vosburgh Stakes. Tragically, Rock Fall broke down following a breeze at Keeneland and had to be euthanized. As the Breeders’ Cup nears, Wohlers stays in close touch with Borell and Runhappy. Borell is already looking forward to next year when she hopes to stretch Runhappy out to longer distances. It’s been an unusual journey for Borell, who has had success thrust upon her and has handled it like a seasoned veteran, and that hasn’t gone unnoticed. “She’s doing extremely well and we’re very proud of her,” McIngvale said. “She and my sister-in-law Laura, (groom) Cordell Anderson, (exercise rider) Omar Torres, and Edgar Prado have done a great job. It’s been a team effort. 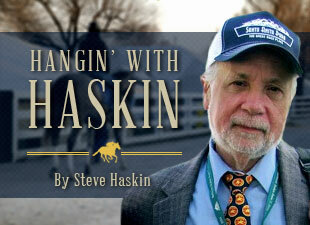 Cordell holds the yearlings in the ring at the Keeneland sales; he’s the one you see holding those big-bucks yearlings. Omar did a great job calming him down after we moved to Kentucky. “Horse racing teaches perseverance. That’s a trait we all need, and I got a double dose of it. I’ve learned from all the trainers along the way. They’ve all been great. I’m a bit flakey, but we’re happy with where we’re at and we’ll keep going with what we’ve got. We wanted to train our horses on hay, oats, and water only and train them hard, and we couldn’t find anyone that fits that bill and would do what we told them. Laura interviewed Maria and they hit it off. Now it’s on to the Breeders’ Cup, and no matter what happens it’s been a dream come true for Borell. And you can bet there will be many more dreams in her future. Like all those who fall in love with horses at an early age, she will, in many ways, always be that 6-year-old girl, and that’s something you never want to lose. Maria Borell leads in Runhappy at Saratoga with Cordell Anderson and Omar Torres. 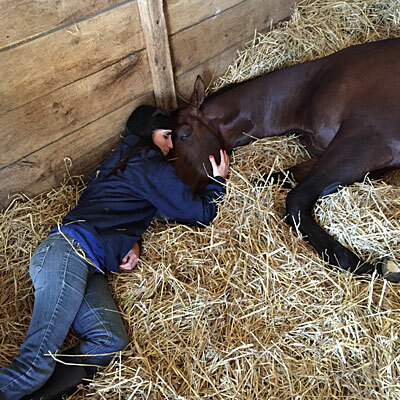 Maria Borell relaxes with Runhappy.